1. What the approximate size of your business in terms of revenue? 2. What % of the sales came from online? 1. Within online, what % of the sales came from Flipkart, Snapdeal? 2. Within online, what % of the sales came from other online retailers? 3. What is your inventory arrangement with Flipkart, Snapdeal and Amazon i.e. do you operate on a “sale or return” basis or do you keep the inventory with you until an item is sold? 4. For Flipkart/Snapdeal/Amazon, request you to tell me what do you like about your experience with them? Similarly, what don't you like? (Elements to prompt on (please take random order), Marketplace reputation / brand strength, Potential volume of sales for your product). 5. What is the base commission rate as well as logistic cost at each of the following sites? answer needs to be as a % of sales? Also, check commission by category. 6. What is the payment gateway charge you pay at each of the following sites? answer needs to be as a % of sales. 7. Have had to lower your prices offline because of listing your products on Flipkart, Snapdeal and Amazon (i.e. as a result of the fact of online being cheaper)? 8. Has listing your products on Flipkart, Snapdeal and Amazon meant that you have been able to reach into more cities? 9. By selling online as opposed to offline are you saving on costs? If yes, which ones and by how much? If respondent does not provide clear answer, test cost heads below. 10.Have you ever stopped selling your products on one of Flipkart, Snapdeal and Amazon? 11.Would you ever sell your products exclusively on one of Flipkart, Snapdeal and Amazon? Q. For Flipkart, request you to tell : a) What you like about your experience with them? b) What you don’t like about your experience with them? 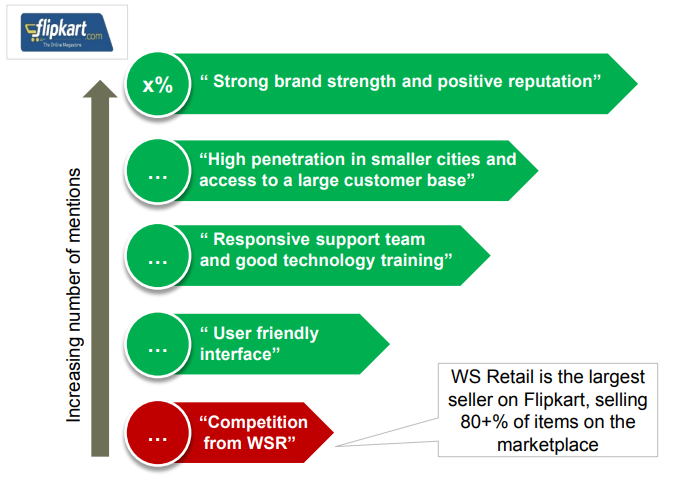 Flipkart has a very positive perception amongst sellers across a majority of the parameters. Brand reputation and reach across cities is considered its strongest point, along with good support and training provided. However, some sellers feel threatened by the high competition from WS Retail. This document covers the behaviour of sellers across key categories with Amazon, Flipkart and Snapdeal. It also covers the perception of sellers towards these three brands.